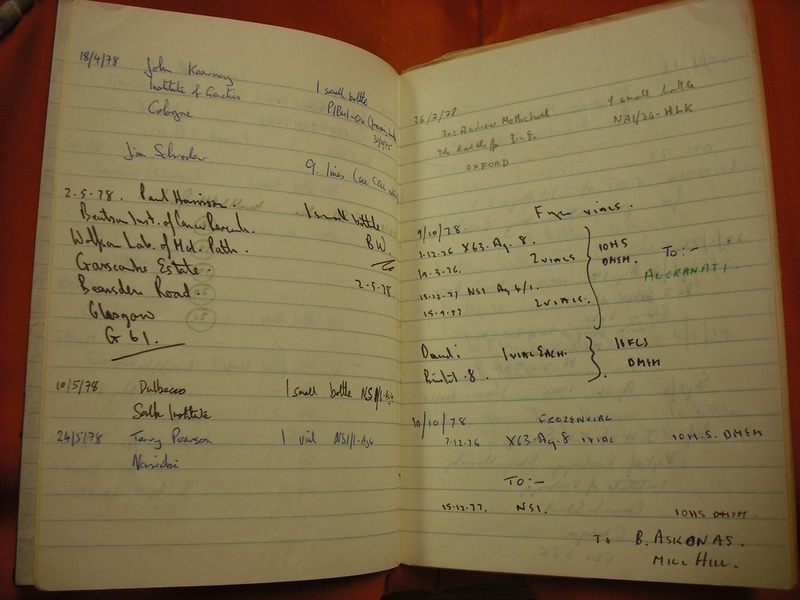 Few could imagine how fast monoclonal antibodies, which were developed originally as a tool to answer a basic research question, would travel from Milstein's laboratory around the globe. Within a matter of months of their first development, Milstein was receiving requests from scientists worldwide for access to the cells. Yet the transfer of the monoclonal antibodies was not a smooth process and recipients initially found the technique difficult to apply. 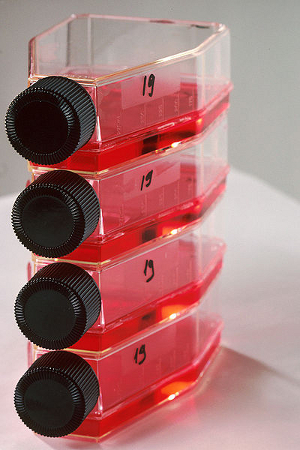 This shows vials containing tissue culture, a reagent used in the production of monoclonal antibodies. Photo credit: National Cancer Institute, Wikipedia. Milstein sent cells in different forms. Some scientists were given myeloma cells or serum containing antibodies taken from immunised mice. Others received the whole hybrid cell (hybridomas) secreting monoclonal antibodies. Alternatively a sample might be given from the medium in which the antibody producing cells were growing, known as 'supernatant', from which the cells could be isolated. Of all the samples provided, hybridomas were the easiest to send as they were being grown all the time in cultures in flasks. Their survival however, was dependent on quick transportation in cold conditions which did not go below freezing; this was difficult to ensure particularly if flasks were placed in the baggage hold of an aeroplane where temperatures were regularly freezing. Other samples needed slightly more preparation, requiring first to be taken out of liquid nitrogen and placed on dry ice. Nonetheless, these samples were slightly easier to transport as they were packed in polystyrene containers that could be placed in the baggage holds. 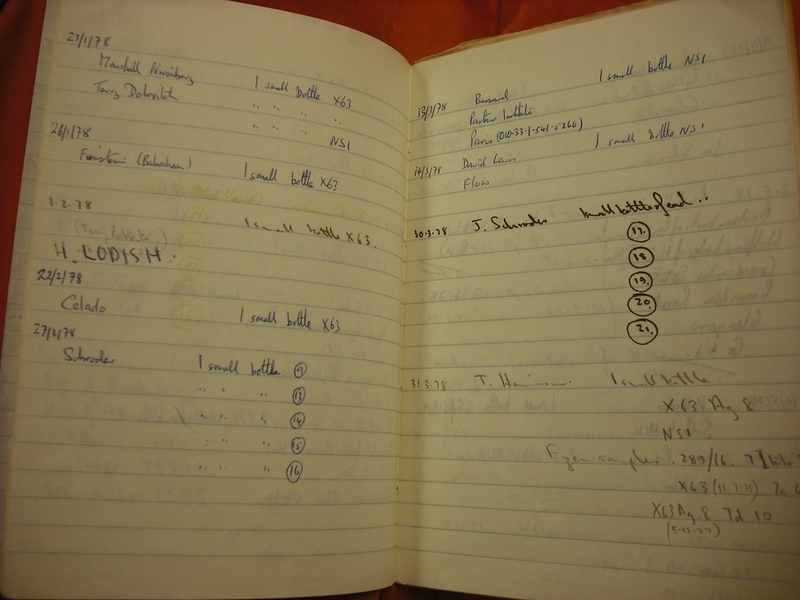 In the early days Milstein recorded the sending of his monoclonal antibody samples in a notebook he kept informally. Each sample was assigned a letter and number according to the type of cell line being sent. Those with the letters 'SP' referred to cloned hybrid cells which had been made from the fusion of a myeloma cancer cell with antibodies taken from the spleen of an immunised mouse. The original hybrid cell was labelled 'SP1' and all subsequent cells were given a new number as they were further generated. Samples labelled with 'X63' referred to the myeloma cell line used to generate monoclonal antibodies in Milstein's laboratory. Samples referred to as 'NSI' were hybrid cells developed later by Milstein with his colleagues, and 'PEG' was the added reagent used to encourage the growth of the monoclonal antibodies. 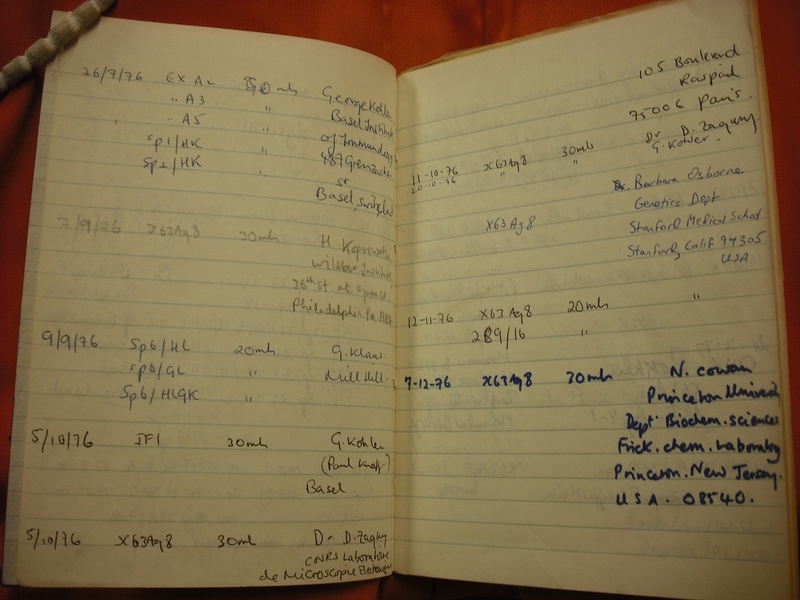 Click here to see some pages from Milstein's notebook recording his early sending of various cell lines. One of the first researchers to whom Milstein sent a sample of some myeloma cells was G. Wilkinson, a junior pathologist at Guy's Hospital, London. These were to be used as a fusion partner for the generation of the hybrid cells to produce monoclonal antibodies. Wilkinson had learnt about the technology from Matthew Scharff, a scientist with whom Milstein had close relations but whom he regarded as a competitor. Yet, while Wilkinson reported success in establishing the myeloma cell line in his laboratory, he was unable to replicate Köhler and Milstein's technique to produce monoclonal antibodies. This was despite numerous attempts over nine months. This shows the first X63Ag8 myeloma cell line Milstein recorded sending. It was the myeloma fusion partner used for creating the first hybridoma capable of secreting antibodies. 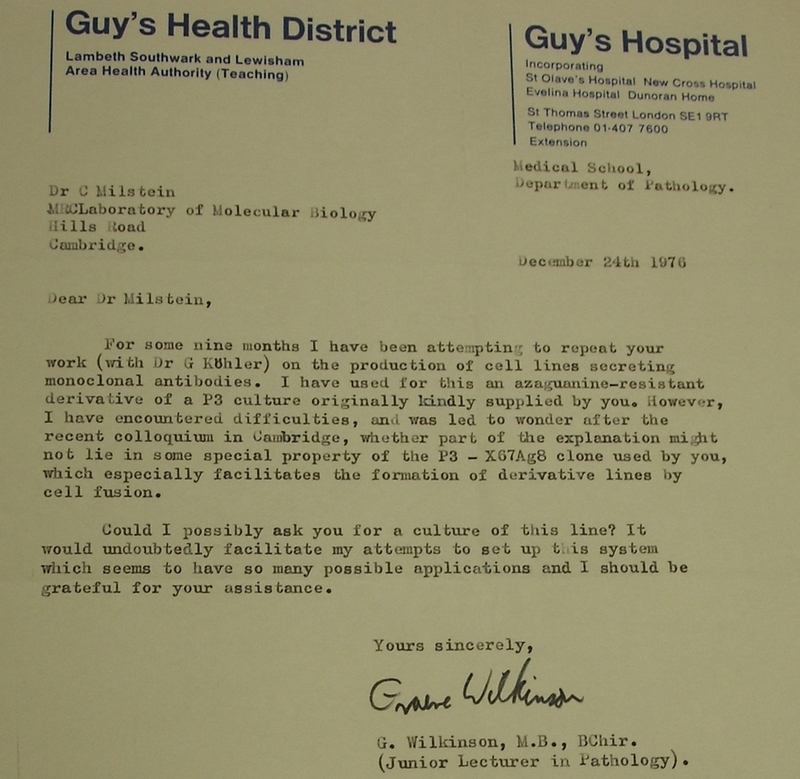 The recipient was Wilkinson, a junior pathology researcher based at Guy's Hospital, London. 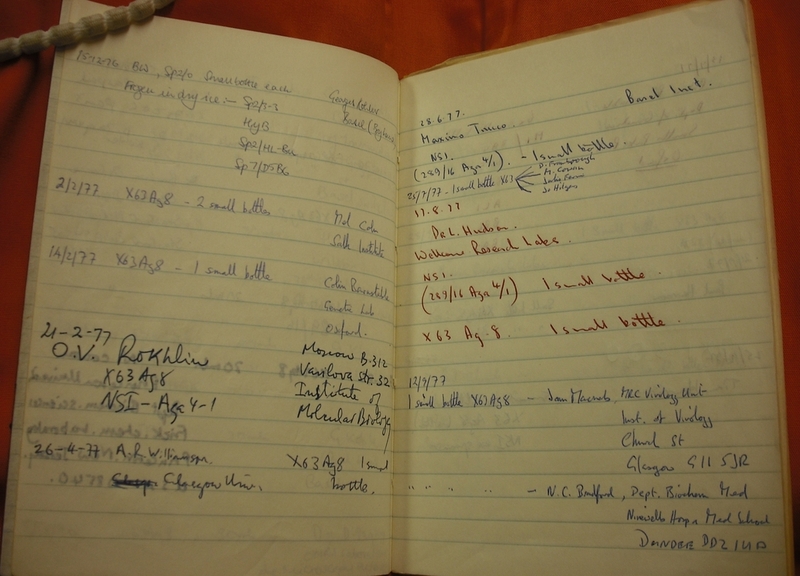 Source: Milstein's notebook, Churchill Archives Centre, Milstein Papers, file MSTN/C.282. 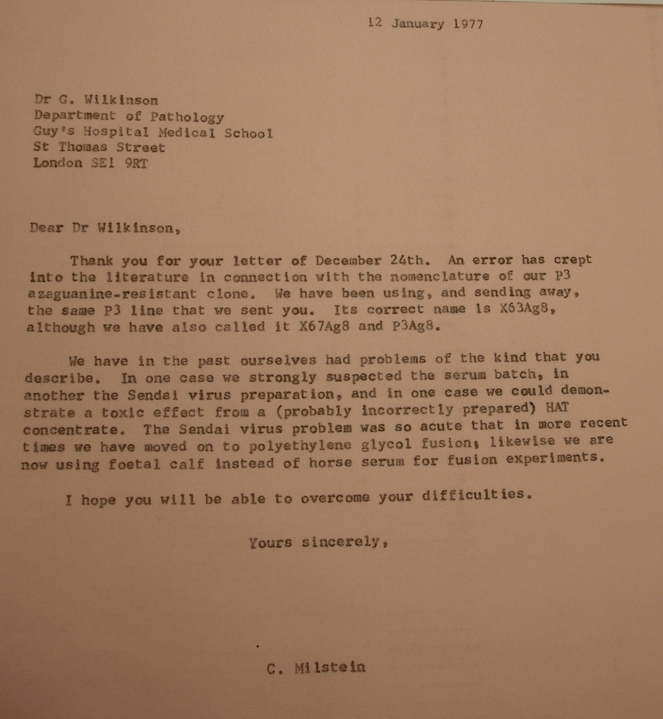 The correspondence between Wilkinson and Milstein reveals how hard it can be to replicate a technique before it becomes a standardised process. 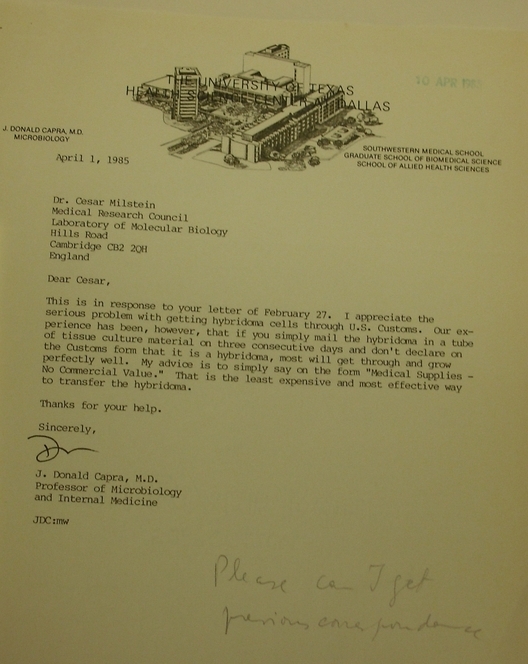 The letters reveal that even Milstein and his team experienced difficulties in replicating the method. Milstein's papers also show that others had similar difficulties. When Wilkinson continued to experience problems, he was advised to visit Milstein's laboratory personally in March 1977 to learn the technique. The difficulties Wilkinson and others faced are evidence of the complexity of transferring knowledge and practice from one laboratory to another. Their experiences show how hands-on experience in the laboratory is not easily replaced by the supply of a set of ingredients and written instructions. 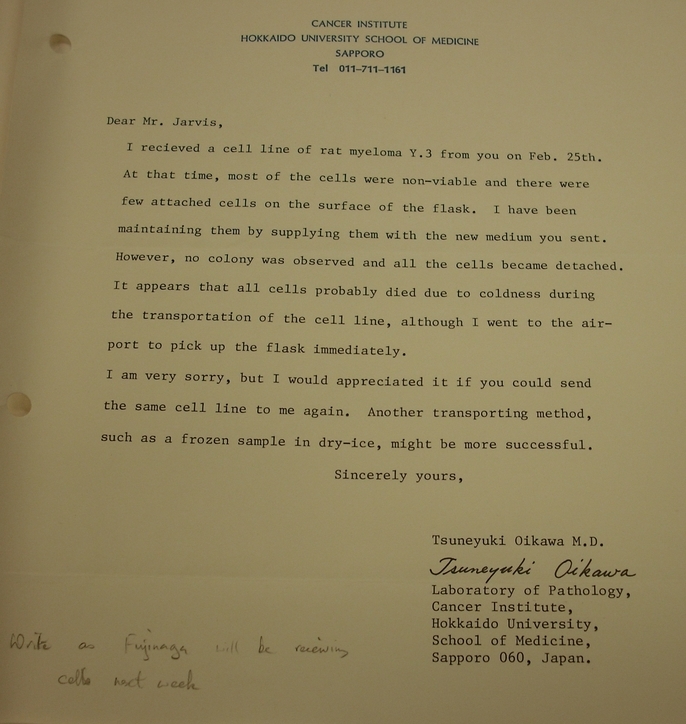 Even after Milstein and his team had made improvements to the process and cell lines, other scientists struggled to produce monoclonal antibodies. This led some to question the viability of the technique and its value for their work. Many of the difficulties encountered, however, reflected the more general complexities associated with the tissue culture, which is plagued by problems such as contamination and the difficulties of stabilising cells. This suggests the fact that tissue culturing may be as much an art as a science. 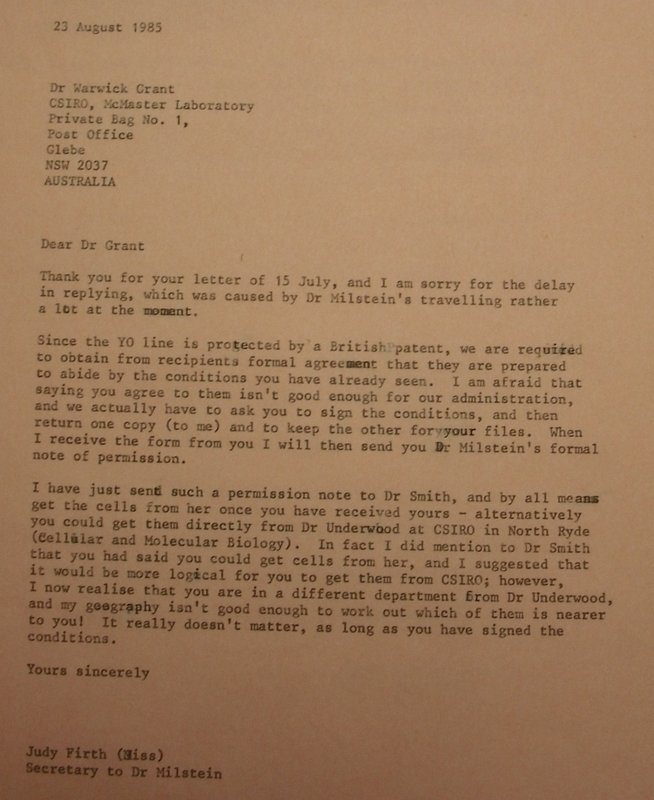 Click here to see correspondence between Milstein and Wilkinson and others concerning the difficulties they had reproducing Milstein and Köhler's technique. The number of samples that Milstein sent out remained small in the first year. 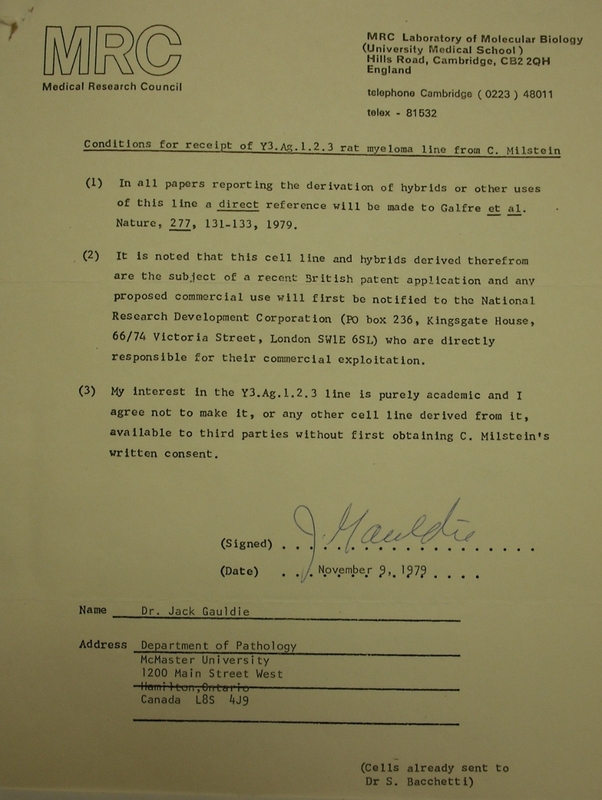 In 1976 different variations of the cell samples were only sent to 8 different individuals, most of whom had some connection with Milstein or his close colleagues. One person Milstein noted as recipient of the cells in December 1977 was Brigitte Askonas who in the 1970s had been among some of the first scientists to find a way of making monoclonal antibodies. These antibodies however only survived a short time. 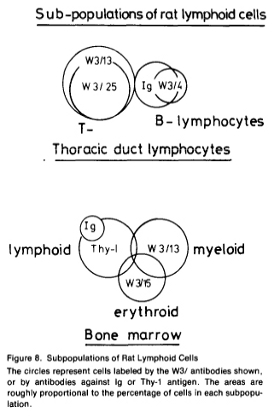 In the first half of 1977, Milstein sent out relatively few cells. From September that year, however, the number began to increase. In that month alone he sent samples to seven people. By November 1977, Milstein estimated that he had sent out his myeloma cell line for making monoclonal antibodies to a total of 50 people. The rise in requests for samples in part reflected the growing interest in monoclonal antibodies awakened by the article Milstein, Galfré and other colleagues had published in Nature the previous April. In it, they reported on the successful development of monoclonal antibodies against rat histocompatibility antigens and this was of considerable clinical interest. Histocompatibility antigens are important as they can be used to establish the unique identity of an organism's tissues and thus to determine compatibility between a donor and a recipient in the process of organ transplants. The importance of this paper can be gauged from the fact that it had been cited in more than 1,490 publications by 1993. By generating monoclonal antibodies against histocompatibility antigens, Milstein and his team laid the foundation for the use of monoclonal antibodies in many other clinical applications. Their paper generated great excitement. An article in Nature publicised the significance of its research. It was written by Ken Welsh, an immunologist then based at East Grinstead Hospital in Sussex, UK, whose inspiration for penning the piece was in part stimulated by his fury at learning of the NRDC refusal to seek a patent for the technology. Welsh believed the technique provided a 'major step forward', particularly for tissue typing which was critical in the care of transplant patients. Welsh was not alone in publicising the potential advantages of the new technique. An editorial in The Lancet in June 1977 also claimed it could 'have profound implications for medical practice.' In addition to its possible uses in transplants, the editorial pointed out its potential for improving diagnostics and therapeutics. 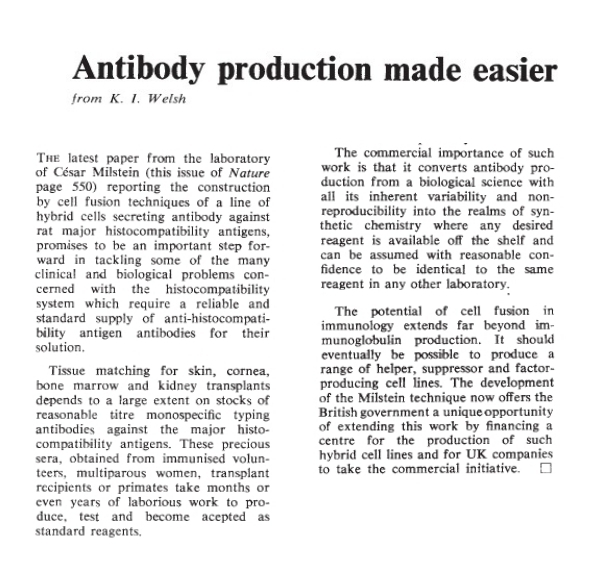 The growing enthusiasm for monoclonal antibodies in the scientific world was further reinforced by a paper published by Milstein with his colleagues in November 1977. 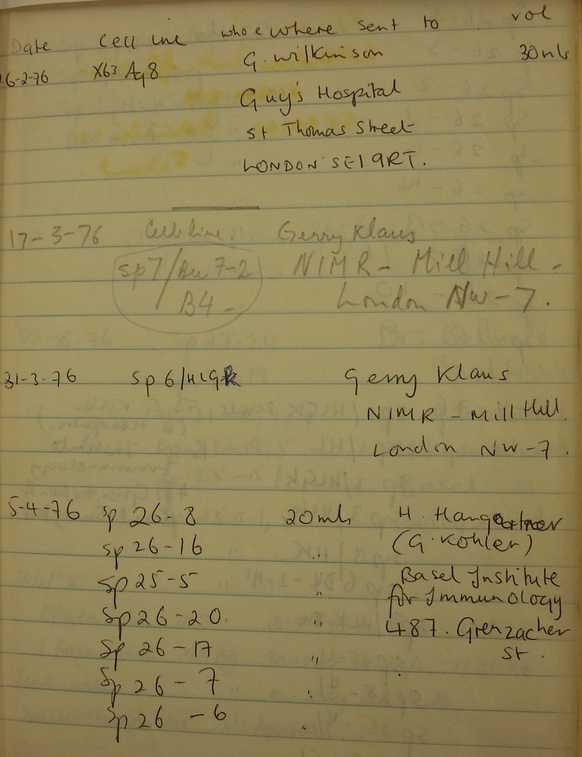 This was A. F. Williams, G. Galfré, C. Milstein, 'Analysis of Cell Surfaces by Xenogeneic Myeloma-Hybrid Antibodies Differentiation Antigens of Rat Lymphocytes', Cell 12 (Nov 1977), 663-73. It highlighted how monoclonal antibodies could be used to identify and distinguish between different markers found on the surface of cells. By 1993 it had been cited 660 times. 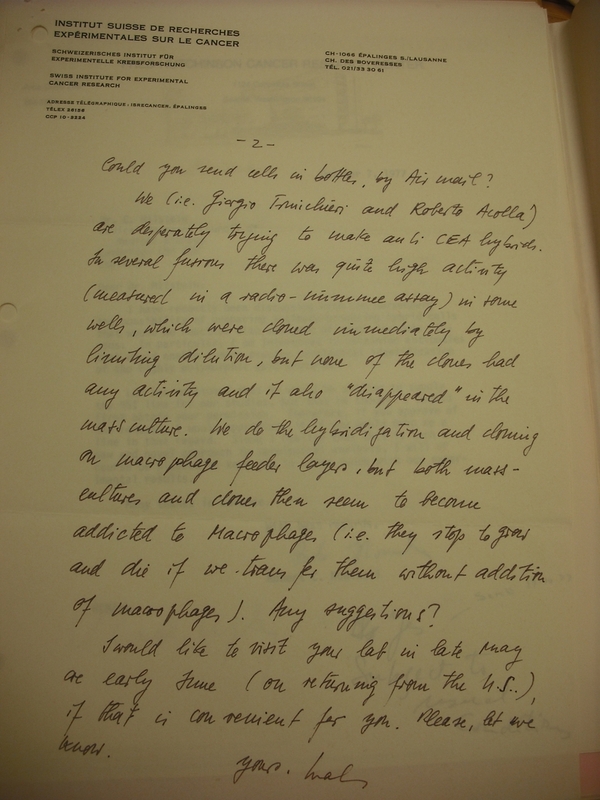 Milstein himself later admitted that his research in this area marked a turning point in his thinking about the potential application of monoclonal antibodies. This shows the different cell surface markers monoclonal antibodies helped to differentiate. It was published as figure 8 in A.F. 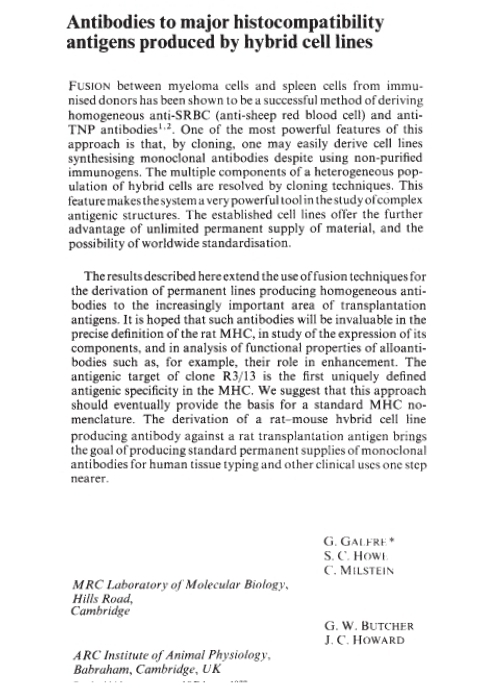 Williams, G. Galfré and C. Milstein, 'Analysis of cell surfaces by xenogeneic myeloma-hybrid antibodies: Differentiation antigens of rat lymphocytes', Cell, 12/3 (1 Nov 1977), 663-73. 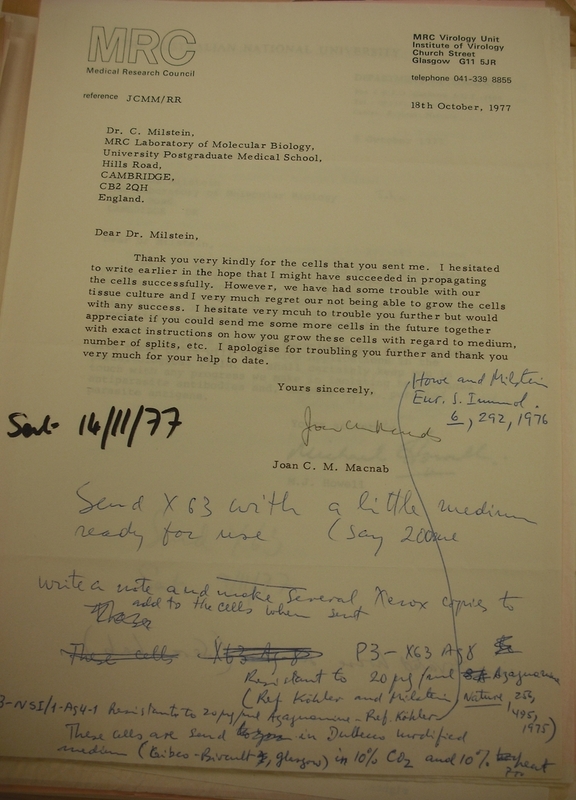 Once scientists realised the significance of monoclonal antibodies to their work, Milstein received a flood of requests for cell samples. 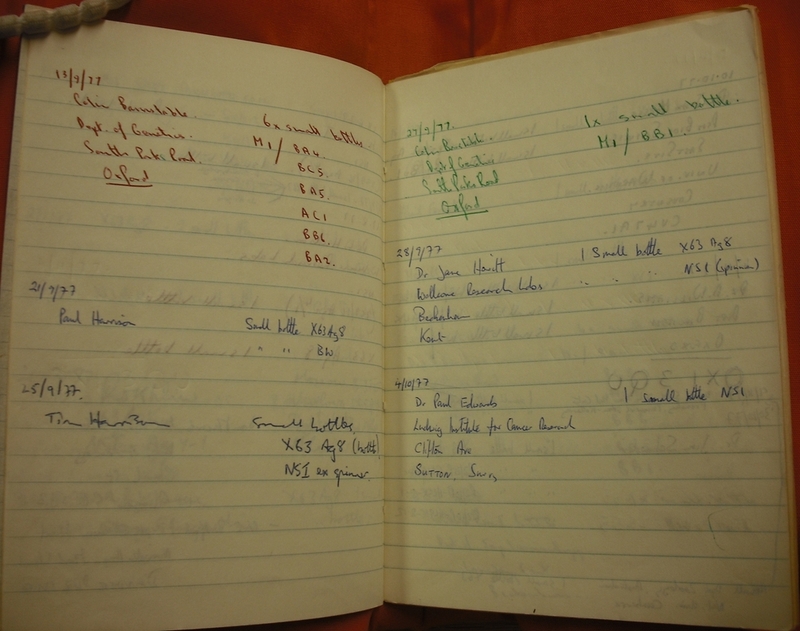 Those recorded in his 1977 notebook were just a few of the many vials that were now being dispatched from the Laboratory of Molecular Biology. Click here for an illustration of the kinds problems that scientists reported when receiving cells from Milstein's laboratory. The way in which cells were distributed varied greatly. Some were collected in person by individual researchers in a cell suspension carried in a test tube in the pockets of individual researchers. Others were sent in parcels through postal services, on trains or aeroplanes. Inevitably the logistics of transportation were not straightforward. Not only were there strikes to contend with, on occasion military coups disrupted transport networks. Less dramatically, transport could break down or customs officials could hold up the process. Any delay or change in environmental conditions could jeopardise the survival of the cells that were dispatched. 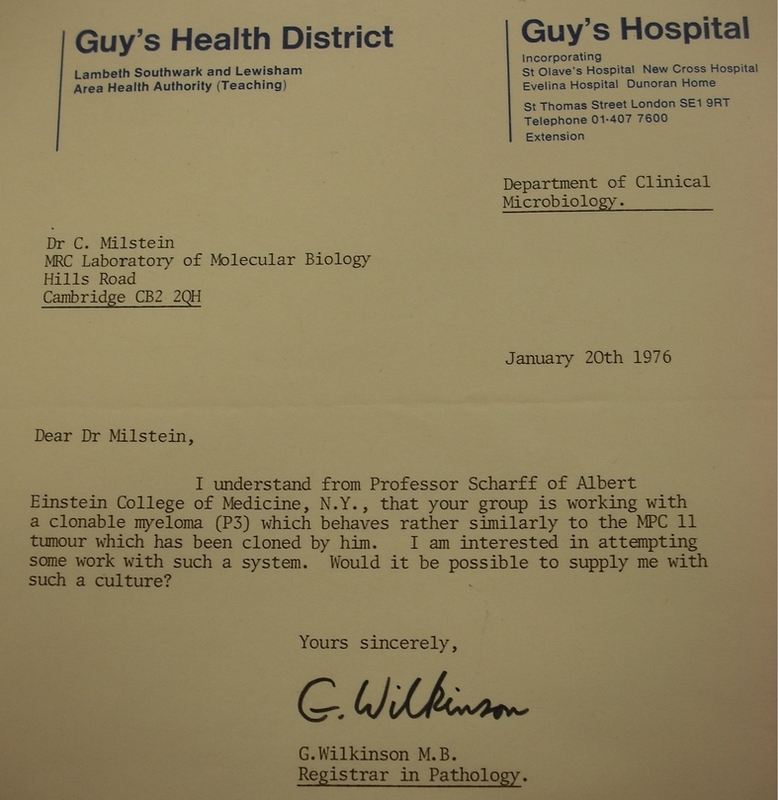 The growing requests for cells therefore imposed significant demands on Milstein and his staff, requiring a high degree of organisation. Not only did they have to grow the cells and then package and label them, but there was also the headache of transport which could involve numerous telexes and phone calls to transport carriers for pick up and delivery. Each batch of cells dispatched also had to be followed up with letters to ensure their safe arrival. Click here to see the conditions Milstein's laboratory laid down to recipients of cells. On top of all of this, international transactions required permits to take packages through customs. All of this could take time and sometimes caused the death of the cells. Even sending samples through the post could be difficult. 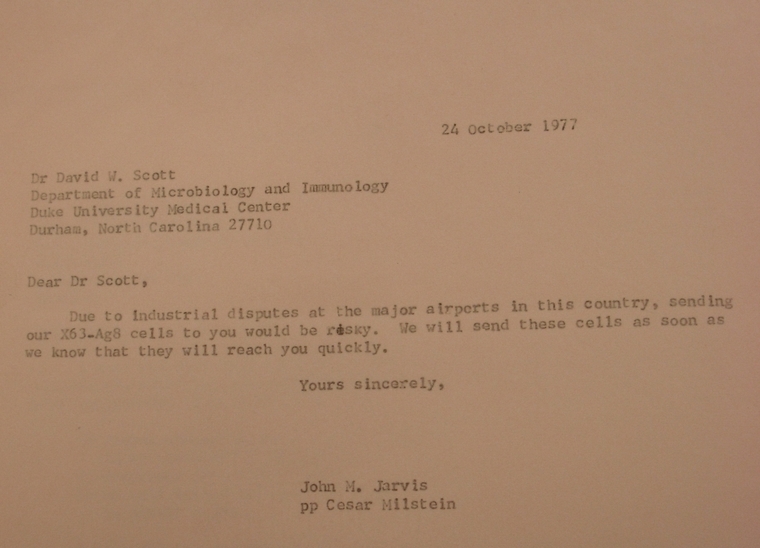 In providing the cells, Milstein's laboratory asked recipients to cover the costs of their transport. This was frequently difficult to arrange. One of the problems was the bureaucracy involved in issuing invoices. In the early years the laboratory was willing to overlook non-payments for shipping. 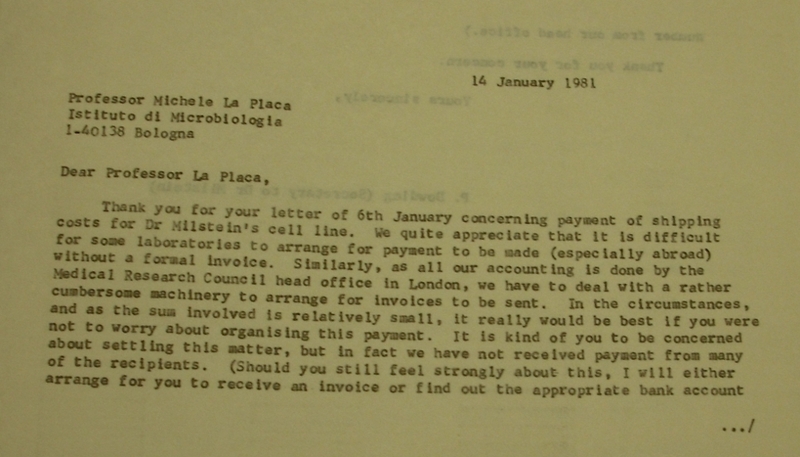 By 1983, however, the financial burden of the work involved in sending cells had become so great that recipients were asked on receiving their samples to send a cheque to cover costs. Two years later the rules were changed so that recipients were expected to send cheques prior to dispatch of the cells. 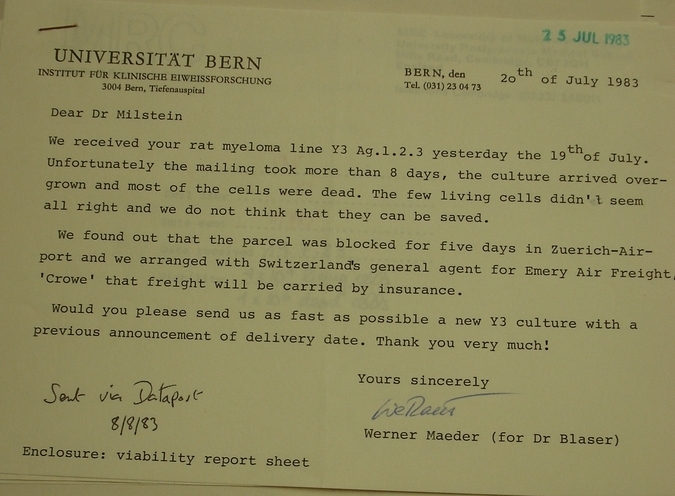 And once the patenting of Milstein's cells became more systematised the process for sending out cells became much more bureaucratic. 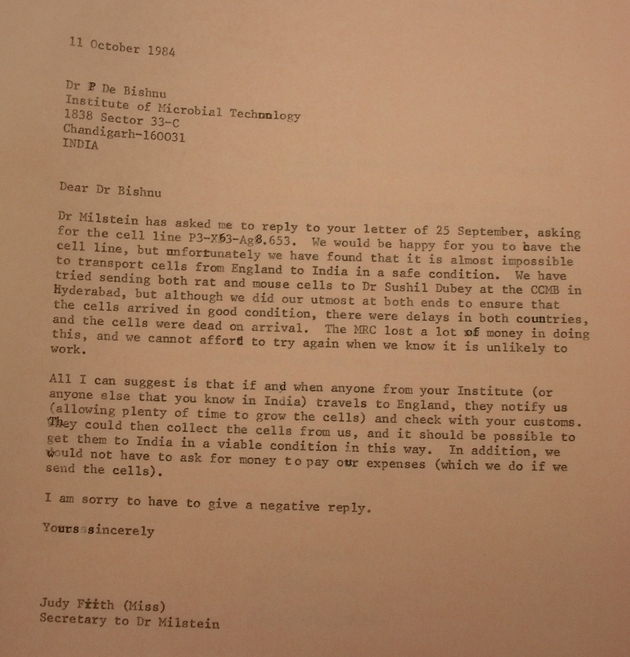 This letter from Milstein's secretary, Dowding, to a scientist in Italy, makes clear it was frequently difficult to arrange payment to cover the costs of transferring cells from Milstein's laboratory. 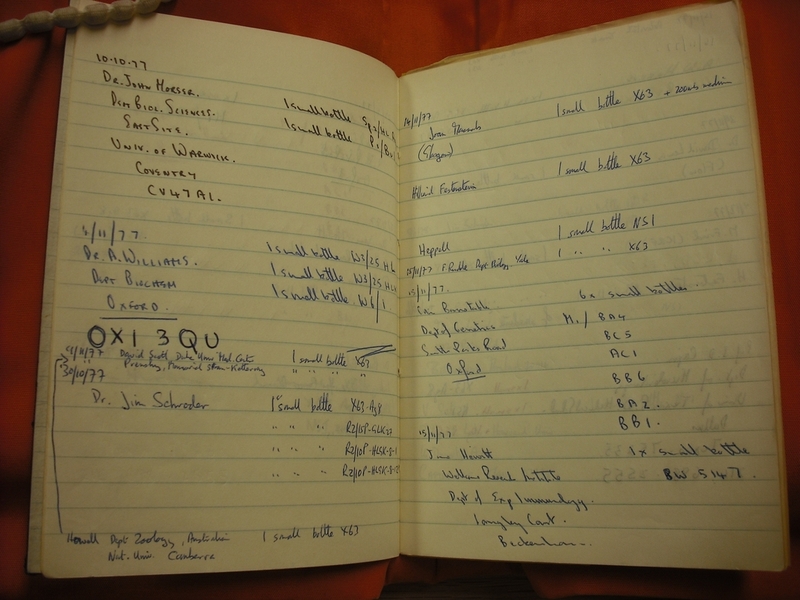 Source: Churchill Archives Centre, Milstein Papers, file MSTN/C303.